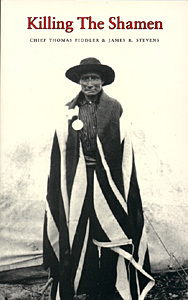 One of the most unusual cases in the history of Canadian jurispudence commenced in Norway House, Manitoba, in the fall of 1907. Killing the Shamen is the true and fascinating account of the events that lead up to the "murder," the trial, and the aftermath. The present work is one volume in a trilogy of Sandy Lake stories, including Sacred Legends and Legends from the Forest. Originally from St. Marys, Ontario, James R. Stevens has co-authored several books with First Nations holymen and leaders, including James Redsky, Chief Dan Kennedy, and Chief Thomas Fiddler. A counselor at Confederation College in Thunder Bay, Stevens is perhaps best known for one of his earlier books Sacred Legends of the Sandy Lake Cree.